20. Mathematics, Magic and Mystery. 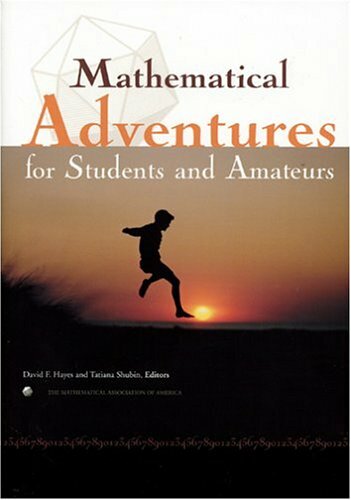 No amateur or math authority can be without this ultimate compendium from America's best-loved mathematical expert. Whether discussing hexaflexagons or number theory, Klein bottles or the essence of "nothing," Martin Gardner has single-handedly created the field of "recreational mathematics." The Colossal Book of Mathematics collects Gardner's most popular pieces from his legendary "Mathematical Games" column, which ran in Scientific American for twenty-five years. 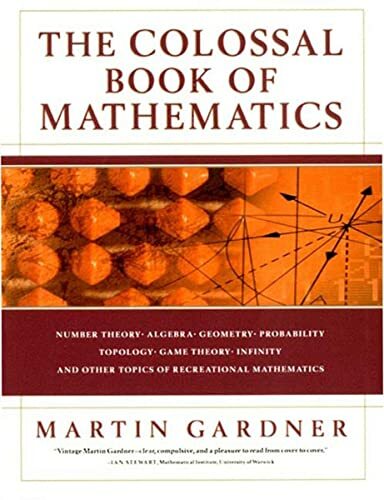 Gardner's array of absorbing puzzles and mind-twisting paradoxes opens mathematics up to the world at large, inspiring people to see past numbers and formulas and experience the application of mathematical principles to the mysterious world around them. With articles on topics ranging from simple algebra to the twisting surfaces of Mobius strips, from an endless game of Bulgarian solitaire to the unreachable dream of time travel, this volume is a substantial and definitive monument to Gardner's influence on mathematics, science, and culture. In its twelve sections, The Colossal Book of Mathematics explores a wide range of areas, each startlingly illuminated by Gardner's incisive expertise. Beginning with seemingly simple topics, Gardner expertly guides us through complicated and wondrous worlds: by way of basic algebra we contemplate the mesmerizing, often hilarious, linguistic and numerical possibilities of palindromes; using simple geometry, he dissects the principles of symmetry upon which the renowned mathematical artist M.C. Escher constructs his unique, dizzying universe. Gardner, like few other thinkers today, melds a rigorous scientific skepticism with a profound artistic and imaginative impulse. His stunning exploration of "The Church of the Fourth Dimension," for example, bridges the disparate worlds of religion and science by brilliantly imagining the spatial possibility of God's presence in the world as a fourth dimension, at once "everywhere and nowhere." With boundless wisdom and his trademark wit, Gardner allows the reader to further engage challenging topics like probability and game theory, which have plagued clever gamblers, as well as famous mathematicians, for centuries. Whether debunking Pascal's wager with basic probability, making visual music with fractals, or uncoiling a "knotted doughnut" with introductory topology, Gardner continuously displays his fierce intelligence and gentle humor. His articles confront both the comfortingly mundane--"Generalized Ticktacktoe" and "Sprouts and Brussels Sprouts"--and the quakingly abstract: "Hexaflexagons," "Nothing," and "Everything." He navigates these staggeringly obscure topics with a deft intelligence and, with addendums and suggested reading lists, he informs these classic articles with new insight. Martin Gardner is the grand old man of popular mathematics. He especially likes the math behind puzzles, riddles and logical conundrums. Logic and mathematics is the source of his thinking on the Skepticism he professes in his writings on pseudoscience, religion, the paranormal, UFO's, and other outlands of science and rational thinking. This book is a collection of his best columns from Scientific American magazine. It was of the good reasons to read the magazine. Like many other things in the last few years, that publication jumped the shark at some point. Gardner was one of the reasons to still read it for a while there. Gardner, however, is not just interested in the mathematics. The men, and history of the questions is also important to him. That is because it forms a context to the questions and the discovery of the answers. Context is very important to the author. Without it, you really don't know where you are. If you like the writing of such good folks like Douglas Hofstadter, Jeremy Bernstein, Eli Maor, John Allen Paulos, Richard Feynman, Stephen Jay Gould, Isaac Asimov, Carl Sagan, Arthur C. Clarke or Ed Regis, than you will probably like the writing of Gardner. Mathematics is something that people don't read a lot. At least not recreationally. Normally because they don't understand that it forms the basis of real logical thought. A real understanding of the modern world requires one of the understand science. And science that isn't, at least in part, based on mathematics isn't real science. It is something more of our leaders should take a real interest in. How can we expect our leaders to make good decisions on cloning or when-life-begins if they have no real understanding of science and mathematics? Which is why Martin Gardner should be considered a national treasure. This book covers a wide variety of subjects. It is not a puzzle book in the strict sense of solving little teasers, but it is a book that starts one thinking in broader terms. Some paradoxes and concepts addressed in this book, that great thinkers spent time debating and questioning, are fun for us more common thinkers to consider as well. This book is certainly not a "Colossal Book of Mathematics", and if you are looking for a book full of "Classic Puzzles, Paradoxes, and Problems", this book is not it. In short, the title is wrong and deliberatly misleading. That should be enough for one not to buy this book at all, for why should one, when the author tries a con-artist trick with the title itself? A lot of the book is full of information about stuff that is tangential to mathematics at best, like Escher drawings and other art. Escher is fine, but devoting so many pages to the symmetry drawings of a certain Mr. Kim is way out of line with what a reader might expect of this book. The "fake" chapter is also in bad taste for a book of this nature. Obviously "once bitten twice shy" is not something Gardner believes in. Also an absence of adequate proofreading is evident. For example, the author claims that N is symmetrical about a horizontal axis. Also wrong (or incomplete) is Gardner's proof about why the second player can never guarantee a win in generalized tictactoe (the "proof" actually proves that the second player can't guarantee a win without looking at the first player's first move). More? The book says 1/0 is meaningless, and this in a chapter on infinity! I however liked some parts of the book, for example an argument against the parallel universe theory is almost literature (it is not Gardner's but somebody else's whose name I've forgotten, unfortunately Gardner does not come across as anything more than a dilettante). Other interesting bits and pieces exist, too numerous to describe here, but scarcely enough to warrant a purchase. On the other hand, if your local library has a copy of this book, it's not a bad one to borrow. I haven't read nearly enough Martin Gardner. This book tickled the math centers of my brain, which only get partially used in my work as a software engineer. If graph theory, game theory, topology, and numbers don't entirely scare you away, you'll find something vaguely interesting at any page you flip to in this book, and after a few more pages will have prob learned something, AND found yourself using a part of your brain that might otherwise go unused during any given day. Nice collection of problems which demand some creativity as well as varying degrees of mathematical prowess. Also populated with interesting anedotes regarding mathematicians throughout history. Although no mathematics beyond the high school level is required, the challenge lies in the ingenious application of even the most rudimentary math and logic necessary to successfully tackle these exercises. The problems range from rather simple to difficult. Some amount to raw logic riddles requiring little or no math while others offer the opportunity to fine tune one's skills in geometry and algebra. In addition to offering a rich variety of problems which will satisfy the needs of puzzlists at many levels, the editors have made a good point of dividing the problems into categories emphasizing different sets of skills including geometry, algebra, arithmetic operations, spatial visualization and logic. Such a delineation makes it easy evaluate strengths and weaknesses so you can focus on areas of improvement. Given the long history of this publication, several problems will be familiar to some seasoned puzzle enthusiasts but most will still provide a fresh challenge. This book may be challenging for infants, but for my intelligence, i found the game boring. 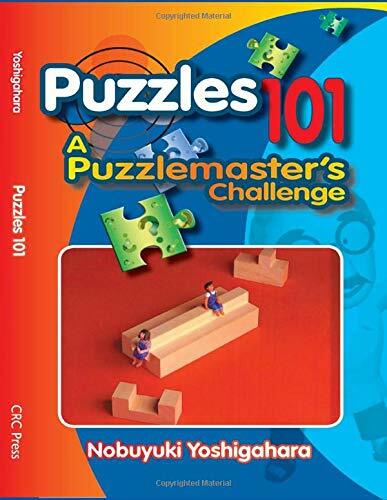 One of the best puzzle books ever. I greatly enjoy mathematical puzzles and brain teasers and regularly look for good puzzle books out there. I picked this one up about 10 years ago, and it's still one of the best I've ever encountered. Many of the problems are short and concise, but provide great challenges. A great learning tool as well as a nice diversion for many ages. I teach my sons using this book (6,8 grades). "The Moscow Puzzles" is unique among problem-solving and brainteaser books because of the wide range of types of problems that it addresses. As a lecturer at Cal Tech's Executive Training Center, I teach "Creating Breakthrough Products" to technical executives. This book has been very helpful for those participating, because the problems it contains represent various types of psychological barriers that prevent problem-solvers and designers from achieving high-level solutions. 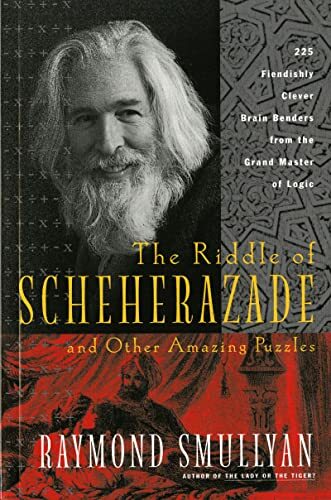 I refer to examples from this book during the Cal Tech training session; we employ the revolutionary Russian problem-solving tool whose acronym is "TRIZ." Other fine attributes of this book are its sense of humor and its practicality. The author has chosen everyday events and situations for his problem "plots," and in doing so, maintains the interest level of the average reader. Readers of this book will learn to overcome personal barriers to creativity (the chief personal barrier is called "psychological inertia"), and will increase their creativity quotients by an order of magnitude, or more. Martin Gardner, as the Master of Mathematical Games and Puzzles, has used his personal exuberance and his fascination with puzzles and magic to entice a wide range of readers into a world of mathematical discovery. As the author of Scientific American's "Mathematical Games" column for 25 years, he gained a large following among puzzlers, magicians, and mathematicians. In the years since then, Gardner has continued to write articles for academic journals and popular magazines. Forty-one of those pieces, never before published in book form, are collected in this volume. Truly a treat for Martin Gardner's many fans, the articles span a wide range of topics. They include games of chance (and why a "computer" will always beat a human player), word ladders and mathematical word play games, tiling puzzles, magic squares, computer and calculator "magic" tricks, and other mathematical puzzles. Gardner at his best, which is saying a lot! It is most certainly not an exaggeration to say that more people have learned more mathematics at the literary knee of Martin Gardner than from anyone else. His columns in Scientific American and subsequent collections in book form have been an inspirational and educational experience for millions. When he "retired" from writing the column, he was succeeded, not replaced. Since his departure from the duties of writing regularly for Scientific American, he has kept busy writing occasional articles for many different publications. He also stays active in following advances in mathematics and how it is taught in the American society. 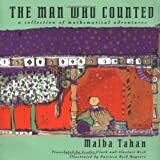 This book is a collection of many of the mathematical articles as well as some of his comments regarding how mathematics is currently taught. While reading the book, I was once again placed in awe of his ability to state the mathematical experience in clear terms. One point follows from another with little or no extraneous fluff. There are many writers of technical books who adopt the style of adding in cutesy dialog that supposedly makes it easier to understand. In keeping with his personality, Gardner simply explains it and is done. It is very refreshing to read material in this form. The topics are generally recreational in nature, although some, particularly those about artificial intelligence (AI) are philosophical. He dismisses the success of the chess playing computers as an insignificant special case. This is true, but he misses what should be the real point of Deep Blue defeating Gary Kasparov. The fact that it took such a computational monstrosity that does only one thing and years of programming to defeat Kasparov shows us how efficient the human brain is and how difficult it is to mimic human intelligence. The remaining topics, such as magic squares, tiling, dissections and word play all sum up recent advances in the field. My favorite essay is one that details how to program magic tricks on a computer. The strategies used are very simple and show how easy it is to perform tricks that seem impossible. I thoroughly enjoyed the book and consider it a necessary read for anyone interested in recreational mathematics. An entire generation has arisen since Gardner ceased his regular writings and I encourage all math teachers to examine his essays for material to use in their classrooms. They are the best explanations of mathematics you can find and it has already been proven that they light a fire of enthusiasm for mathematics. Puzzle lovers of every persuasion, prepare to be mystified and wonderously maddened! 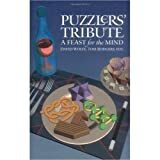 These 51 original puzzles by Barry R. Clarke, puzzle columnist for the Daily Telegraph (UK), present challenges ranging from moderate to difficult and span a terrific range of clever conundrums : word puzzles, complex crosswords, and math and logic puzzles. The first section, Popular Puzzles, calls for a moderate amount of effort and imagination. It features complex crosswords in which cryptic clues must be solved in sequence and the solutions fitted together on the grid. Teaser Tales, the following section, contains longer puzzles in the form of amusing stories with a series of clues that must be solved to provide a single solution at the end. Almost exactly ninety years ago, Sam Loyd's 'Cyclopaedia of Puzzles' was published in New York. This was a collection of a very large number of his puzzles which had mostly appeared in the American Press. Many were illustrated with delightful pictures at the head of the page, drawn in Sam's own hand. Barry Clarke's new book has marked similarities in layout with illustrations drawn by the author at the head of many pages and many puzzles had previously appeared in the 'Brain Twister' column in the Daily Telegraph. The drawings are remarkably like Sam Loyd's, but there the similarity stops. Sam Loyd's book was foolscap size and hard bound while Barry's has the typical Dover cover, but the real difference is in the puzzles themselves. Barry's puzzles are graded in difficulty, so that readers who do not wish to be challenged too much can start with the first section and gradually work themselves in. Also, the puzzles are ingenious and well thought out and hints are provided before the full solutions for those who need a bit of steering. This is altogether a very good read, guaranteed to keep the puzzler in the family busy over Christmas. I thoroughly recommend it. In this most recent adventure into the Puzzling World of Barry R. Clarke, I found my mind quite well entertained. What I enjoy most about logic puzzles is their requirement for little if any prior knowledge, and each of Barry's "puzzlers" is no different. However, what is missing in most logic and mathematical puzzle books is a touch of true creativity and humor. In Brain Busters! I found that while my mathematical mind was challenged to the limit, I was also encouraged to think in new and original ways, moving from basic logic to the simple yet complex world of recreational mathematics. Barry Clarke pushes your mind to the edge with this most recent creation, and holds you there. As Mr. Clarke notes in the introduction, his reasons for this puzzle compilation included the pure enjoyment of creating logical and mathematical art. Fortunately for us, Barry's creations serve not only the role of entertainment, but also more importantly the role of instruction, as he leads us down different paths of twisting logic, with excellent scenery along the way. If you view mathematics as a form of poetry, you will certainly enjoy this opportunity to learn from a mathematical wizard. Brain Busters! is indeed a "mind-stretching" experience, one that allows you to see the way Barry's imagination is captured in a distinctly unique manner in each of his puzzles. His mathematical imagination is the communality that runs through each puzzle, but at the same time it is his creative touch that serves as the specificity, giving great variation to this excellent and enjoyable work. I'm always thrilled when an exciting book of puzzles appears on the bookshelves, especially if it is by Barry Clarke. 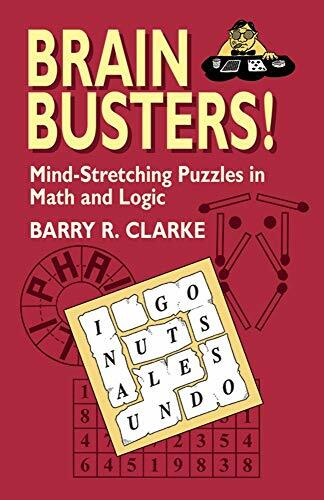 Brain Busters, like Barry's other books, demonstrates his wonderful ability to create funny offbeat puzzles as only he can. Besides the imaginatively written puzzles, I really enjoyed his charming cartoons that accompany many of them. My favourite one is of a sorcerer who has just turned the furious Count Lettuce into a little furry creature. 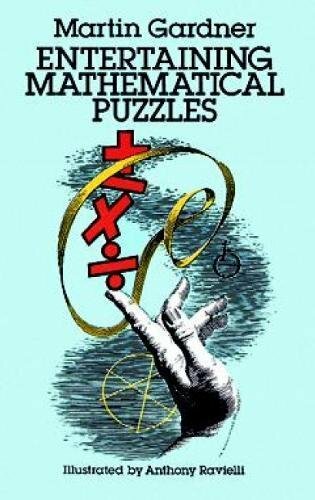 This collection includes more than 100 of the best (and some of the toughest)mathematical puzzles ever to appear in one volume. this book is interesting and challenging, even to people who have studied math at the college level. the problems are short, and take about an hour to solve, at least they did for me. it was a great read and i highly recommend this as a gift for the math lover in your life. Wow, what a splendid collection of varied and challenging puzzles - a puzzler's delight! I especially liked the "handicap" puzzles - these are new to me, and involve algorithmic puzzles with bizarre handicaps having to do with memory. The book also has extensive refrences so you can further your interests for a particular type of puzzle. There's even an unsolved puzzles section to challenge even the professional mathematician. In terms of difficulty level, I would say that 2/3rds of the puzzles are meant for the seasoned puzzler and do require some "mathematical maturity" . But there are quite a few "insight" puzzles that required almost no math. There's even geography puzzles of all things - that's quite refreshing and original for a math puzzle book. 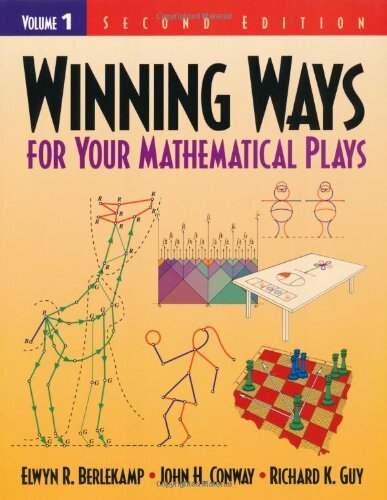 In the quarter of a century since three mathematicians and game theorists collaborated to create Winning Ways for Your Mathematical Plays, the book has become the definitive work on the subject of mathematical games. Now carefully revised and broken down into four volumes to accommodate new developments, the Second Edition retains the original's wealth of wit and wisdom. The authors' insightful strategies, blended with their witty and irreverent style, make reading a profitable pleasure. In Volume 2, the authors have a Change of Heart, bending the rules established in Volume 1 to apply them to games such as Cut-cake and Loopy Hackenbush. Bizarre imagination, originality, trickiness, whimsy characterize puzzles of Sam Loyd, America’s greatest puzzler. Present selection from fabulously rare Cyclopedia includes the famous 14–15 puzzles, the Horse of a Different Color, and 115 others in various areas of elementary math. 150 period line drawings. A good puzzle is much like a classic novel. You read it and then after a certain period of time, you can read it again and enjoy it just as much as the first time. 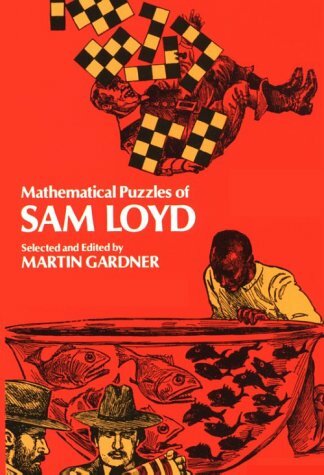 These puzzles of Sam Loyd, which were published over a century ago, stretch the brain cells as much now as they did when they dazzled the people of a younger country. The problems follow very standard themes. Having read many puzzle books, I recognized the form of all of the puzzles in this one. However, they are so well stated that reading them is a significant part of the fun. It is also an interesting piece of historical perspective that puzzles were also a very popular staple in newspapers over a century ago. Reading the puzzles and looking at the diagrams also takes you back to a different age. Some of the caricatures of the figures could not be used in the politically correct atmosphere of today. It also seems most unlikely that a problem involving nuns being abducted by soldiers would be published in a modern newspaper. Therefore, it is necessary to cut a little historical slack when you read the book. Sam Loyd was the best puzzlist that America has ever had. The only possible challenger is the editor of this collection, which is most fitting. I enjoyed the book immensely, even though I was in most cases rereading rather than solving for the first time. If you really like tough puzzles, that is the book and the writer that you were looking for. In one book there is enough puzzles for a human being life. How should you encode a message to an extraterrestrial? What do frogs and powers of 2 have in common? How many faces does the StellaOctangula have? Is a plane figure of constant diameter a circle, and what does this have to do with NASA?Is there any such thing as a truly correct map? What patterns are possible in juggling? What do all of these questions have in common? They--and many others--are answered in this book. Some of the authors of the articles in this collection are distinguished mathematicians; some are bright newcomers and others have been well known in mathematical circles for decaces. The table of contents is a veritable "who's who" of active mathematicians. This is a partial record of the Bay Area Mathematical Adventures (BAMA), a lecture series for high school students (and incidentally their teachers, parents, and other interested adults) hosted by San Jose State and Santa Clara Universities in the San Francisco Bay Area of California. These lectures are aimed primarily at bright high school students, the emphasis on "bright", and as a result, the mathematics in some cases is far from what one would expect to see in talks at this level. There are serious mathematical issues addressed here. 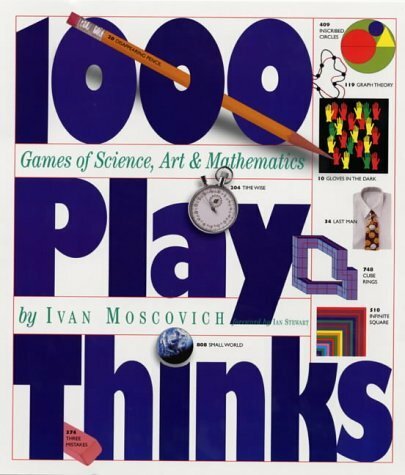 1000 PLAYTHINKS is the most compulsive, head-scratching, and-at 5.08 pounds-gargantuan puzzle book ever. An obsessive collection of 1,000 challenges, puzzles, riddles, illusions-both original as well as must-do classics. Jam-packed on the page and illustrated throughout in full-color, with a visual for each entry, the book, opened anywhere, is like a call to action. And once started it's hard to stop, because at the end of every successfully completed game the puzzle-solver feels smart, successful, and at one with the beauty of mathematics. (Puzzle 307) Morley's theorem is (to quote the late H.S.M. Coxeter) "one on the most surprising theorems in elementary geometry", but Moscovich manages to get the diagram wrong! The triangle which he picks out does not even look equilateral! (Puzzle 772) For the well-known puzzle of passing a cube through a smaller cube the author begins his explanation: "If you hold a cube so that one corner points directly toward you, its edges outline a hexagon. It then becomes obvious that the cube has ample space for a square hole slightly larger than one of its faces." There is even a picture of a hexagon with a square superimposed on it. Although a cube can be passed through a (slightly) smaller cube in this way, it is well known that the optimum solution does not have the edges of the hole parallel to the space diagonal of the cube. (Puzzle 990) Weighing from 1 to 40 grams using weights on one side of a balance only. Moscovich says "you must have the weights 1, 2, 4, 8, 16 and 32 grams". Not so. For example, 1, 2, 4, 8, 9 and 16 would be ok. I began to compile a list of errors in this book, but I gave up when I had accumulated over 30, having read, I would estimate, about a quarter of the book. The book has a "Difficulty Index" which should be renamed the "Difficult Index". You have to know the exact title of a puzzle and its level (from 1 to 9), in order to find it again using this index. I like to have my brain teased. This book can do that, but it also lies to my brain and does what EVERY OTHER BOOK LIKE IT HAS DONE. It pulls out information that is never stated or implied. One of the questions is "What is the chance that two dice thrown will come up with an even result?" the answer in the back shows a picture of dice numbered one through six on the top and down the left. (much like a chess board) Then the sums of their sides are shown in the corresponding spots on the board. The answer then says that you would get 18 out of 36 even numbers if you threw the two dice. Here is where the flaw with this book comes in to play. The question was asking probability but the answer was giving you outcomes. The rules of statisitcs make these two things seperate. The probability is 12 out of 21. The outcomes are 18 of 36. My statistics class taught me that. But he uses the outcomes as probability. The problem here is that you have overlap in the numbers. The 1-3 combination is the same as the 3-1 combination because the question originally asked for a result of the dice. The second problem was with one of the other kinds of these brain teasers. The question was too find out who the four people in the picture were and what they liked by what they were saying. The question said "This is a group that I belong to." I was not catching on to the fact that the author of the book was named Ivan and therefore could not figure out why the answer named one of the people Ivan. I get it now, but it is one of those annoyances with these kind of books. The third question that I had a problem with said can you figure out the three mistakes in the following statement. "What are the tree mistake in this sentence?" Okay the answer says 1- the mispelled "three". 2- the missing s at the end of mistake. and here's the kicker 3- there is no third mistake so that IS the third mistake. COME ON. Most of the book however is good and challenging to the brain. These are only a couple that have soured me to the "1,000 PLAY THINKS". I would however recommend it to look at and get but make sure you check that the answers are correct and don't take them as gospel. I'm re-entering this because the review I submitted on March 8,2002 does not appear with my reviews under (see more about me). I bought this book because it is beautiful and it looked like fun brain exercise. But much to my disappointment I found too many mistakes in the answers. A good example is the very pretty Pick Up Sticks. The answer in the back is most definitely wrong! I find this type of error in this type of book to be unacceptable, and think it could be very frustrating and discouraging to a person that might not be able to tell whether or not their answer was indeed correct and the book was wrong. I returned my copy to the book store. I first read this book in the original Portuguese many years ago, when I was still in grade school. Imagine my surprise when I found a copy in English! This is a truly marvelous book. 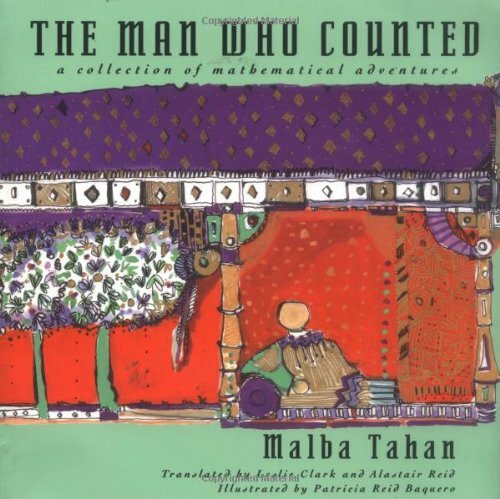 It recounts the life of a humble, but wise sheep herder in ancient Arabia who through the power and beauty of mathematics and logic lives the greatest adventures. It tackles in beautiful form some basic principles of mathematics, and teaches the reader the power of logical thinking. A book for all ages, highly recommended. Amazingly good! The best Math book I've ever read! You've got to read it! You're gonna love it, I can assure! This book made me start loving Math. It really shows how Math can be beautiful. Now I've been a Math books worm since the day I started reading it. I was 13 when I read it. I can still remember the high brought on by a book that vigorously exercised my mind and imagination. 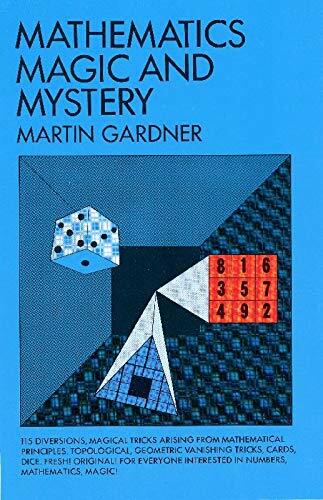 The tradition of a publication based on the Gathering for Gardner continues with this new carefully selected and edited collection in which Martin Gardner and friends inspire and entertain. 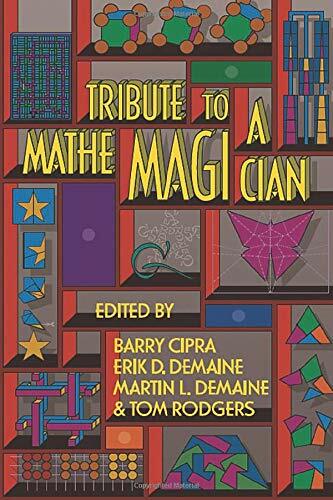 The contributors to this volumevirtually a list of Whos Who in the World of Puzzlestrace their inspiration to Martin Gardners puzzle column in Scientific American and to his contributions to the world of recreational mathematics. Tribute to a Mathemagician contains an author index for the two previous books in the collection of books based on the Gatherings for Gardner. well worth the effort. You can always tell the work of a genius because it illuminates the landscape and shows us things we have never seen before. I design games for a living and this book rocks! Hackenbush, Nimbers, games with 1/2 move advantage. Well illustrated. ONLY PROBLEM: Where are volumes 2-4? This is a classic set of books, and greatly improved from the original version. But if you're looking for the old Volume 1, this book will disappoint. 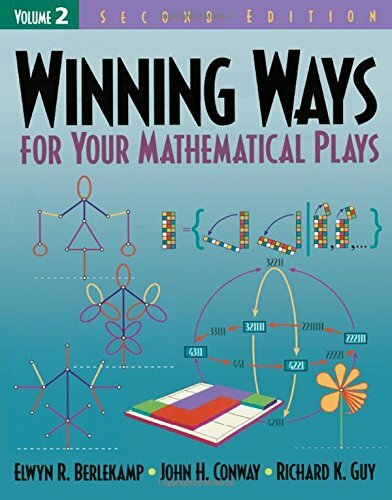 The second edition of Winning Ways is split into 4 separately published books. So THIS Volume 1 is just half of the old Volume 1. Be prepared. Games come in many forms! 1) There are two players. 2) There are many different positions, with one singled out as the starting position. 3) Players move according to very specific rules. 4) The players move alternately. 5) Both players have complete information. 6) There is no chance element to the play. For example, dice are not involved. 7) The first player unable to move loses the game. 8) The game will always move to a state where a player cannot move, which is an ending condition. The hardest part of the material is the notation, it is unusual and absolutely necessary to understand the treatment of nearly all the games. However, once you get over that, something that took me a couple of passes, the games become interesting. Some of them turn out to be trivial, although at first reading, that would not be your conclusion. I also would caution you that this is not recreational mathematics in its base form. These games and problems are nontrivial and most require some serious thought, even when the result is simple. As I read through these games and the mathematical examination of the consequences of playing them, I was struck by two semi-profound thoughts. 1) The human mind can create a game out of just about anything. Some of these games are nothing more than colored marks on paper. 2) Even simple rules can generate complex results. However, mathematical analysis gives us powerful tools that inform us how to win, or as the case may be, how not to lose, or to lose as slowly as possible. Berklekamp and company have created a classic work that is a must read if you want to understand game-like behavior. While not easy, it is some of the most worthwhile material that you will ever read. I read the first edition several years ago and found the going just as interesting the second time. Seeing my frustration at being thoroughly unchallenged in logic in my math class at school, my mom bought me this book. I owe her one. There are coercive logic puzzles, easy but sneaky riddles, and math games. There are liar/truthteller problems to keep you guessing for hours. That said, this is also a great book to read on a plane. It is so complete, you will never need another brainteaser book. That is, until you memorize all the questions. Smullyan is a national treasure. Another challenging set of puzzles from one of our most inventive minds. 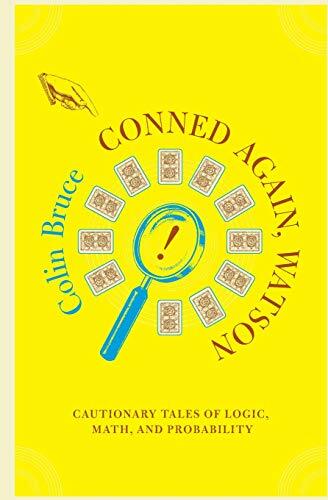 The book not only has a range of great puzzles, and introduces 'coercive logic' puzzles, but is fun to read as well. The use of the Scheherazade tale as a backdrop is clever and fun. As usual Smullyan gets us to a deeper understanding of logical theory, while we think we're just playing games! In this tale, Raymond Smullyan takes us on a fantastic journey from Ancient Persia, when women befuddled kings for their lives. The book then takes a twist into the modern-day field of coercive logic and Godel's Incompleteness Theorm, all the time throwing enough puzzles at us to have us reeling and groping for an eternally mysterious truth. It has aided me greatly in my quest for logical understanding. The best puzzle book I've ever read. Ray Smullyan presents many different types of puzzles. I've read many puzzle books, and this is my favorite by far. It's never been so much fun to learn. This latest collection of puzzles from the internationally acclaimed puzzlemaster Nob Yoshigahara covers a wide variety of puzzles from physical to visual, conceptual to mathematical. Nob is a revered Japanese puzzlist so the publisher (AK Peters) ought to be commended for giving us the first English translation of his many excellent puzzle books - this was long overdue. As far as content is concerned, this book has mostly penny&matches and cut-up&reassemble type puzzles - so in a sense,it is a variation on an already known theme. However, most of the puzzles have a fresh twist which makes them thoroughly engaging -- but quite a few are blood-letting head scratchers! The book is well illustrated and has a nice introduction by Nob. A thrilling way to learn about probability, statistics, and math-by watching Sherlock Holmes help victims exploited by evil con men. 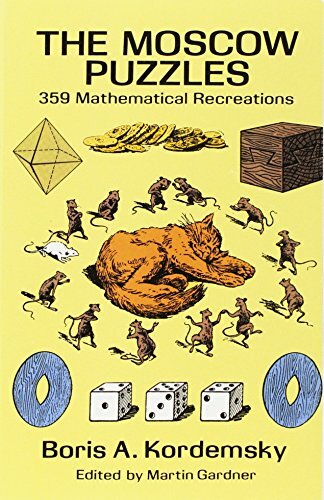 Some time ago, Lamarr Widmer, the editor of the problem column of "Journal of Recreational Mathematics" submitted a review of this book to me, in my capacity as book reviews editor of JRM. As soon as I read the first two paragraphs of the review, I knew that I had to read the book. Sherlock Holmes is without question the greatest character to appear in fiction, the style of the stories still inspire many spin-offs. In the science fiction television series, "Star Trek: The Next Generation", the Holmes style of problem solving is used in many episodes. This book presents several stories where Holmes solves problems with a mathematical theme. Each of them is a delight to read and I did a good deal of head scratching as I tried to anticipate the solution to the puzzle. My favorite story in the collection is "The Case of the Martian Invasion", which, set at the turn of the twentieth century, covers the possibility of heavier-than-air flying machines, "Martian" images on the Moon, crop circles and secret messages being embedded in biblical verse. The proponent of a Martian invasion believes that heavier-than-air machines are possible, putting forward the fundamental principle of using complex machines. That is of course redundancy, where multiple engines are placed on the aircraft in such a way that it can fly with any subset above a certain size. The explanation of the "secret messages" is easy, nothing more than a simple exercise in the probability of the frequency of the appearance of letters and looking hard enough. The other stories were nearly as interesting and cover many areas of life, the probability of various events being the most common scenario. Game theory and decision theory is also used to solve the cases brought before the greatest detective of all time. Although they are set in the time of Holmes, the events described in the puzzles can still be applied to life in the twenty-first century. I found this to be one of the best demonstrations of logical deduction based on sound mathematical principles that I have ever seen. Although he is constantly praised for his skill in logical deduction, Holmes also possesses another talent, that of a master teacher. Published in the recreational mathematics newsletter, reprinted with permission. Watson we've got a winner! If I could guarantee that the author of this book was as wise as his characters, I would marry him sight unseen. Regardless, this is a book worthy of many readings. Unlike some other reviewers, I am neither a statistitian nor a Sherlock Holms lover. I never cared much for murder mysteries perse, but as a tool for exploring such interesting concepts I thought it worked well. Yes he took a few liberties with history (as he pointed out in the end notes)--so what? The stories were not designed to top those of doyle but to make some interesting probability and decision making concepts approachable, relevent, and enjoyable. This they did wonderfully. As someone who was turned off to math after years of dull, abstract school lecture, my interest arose from my work in business and computer science. Some of these concepts were not new to me, but all were from new angles. I found .the math easy to follow(depressingly difficult to predict!) and only wished I had not run out of pages. I plan not only to check out the author's other work, but some of the additional reading he kindly suggests in the notes. Thank you Mr. Bruce for and enjoyable read. This is good enough at what it does: illustrating mathematical concepts under the guise of Sherlock Holmes stories. However, I have one beef and that is that Bruce, perhaps through lack of information on his own part, makes Holmes less intelligent than he should be. My main example is that throughout the book, Holmes and Watson make reference to the year 1900 (their present year) as being the beginning of a new century. I feel certain that Holmes at least would know that centuries do not begin until the year one, in this case 1901. When Watson mentioned it, I felt sure that Bruce was taking the normal tack of making him obviously less intelligent than his partner (the man *is* a doctor, for crying out loud, give him *some* credit), but when Holmes mentions it later, I was duly perturbed. Bruce also uses characters purely to tack on surprise endings to his stories, one of which did not work for this reviewer. In one story, the pair meet the Reverend Charles Dodgson, which any bibliophile knows is the real name of Lewis Carroll, but does not present this information until the last paragraph of the story. The surprise ending, using the pseudonym, was therefore lost on me. In another story, there is no solution presented to a murder. This irked me no end at first, but then I realized that there being no solution to the mystery better illustrated the mathematical principle being explained. I still prefer my murders to have solutions, however. All in all, this is an entertaining book. Bruce's skills as a storyteller and his ability to mix lessons into his stories is commendable. The stories, as Holmes pastiches, ring true overall, only clunking during the details I have mentioned, such as certain actions that seem totally out of character. One other example is when Sherlock and Mycroft are explaining a principle and Sherlock pulls out a graph to illustrate. Bruce (as Watson) writes the following (to the best of my memory): 'I jumped up, knocking over my chair, and cried, 'I have a horror of algebra!'' I couldn't help but laugh! This behavior from one of the most beloved characters in literature? But, as I said, as a whole the book succeeds, and if you can overlook these details and engross yourself in the superb storytelling, you will enjoy yourself, and probably be educated in the process. I have not read any of Colin Bruce's previous books. They seemed to be highly acclaimed, and I bought this title based on that reputation and some strong reviews here at Amazon. I have to say I disagree. There are just no "AHA!" moments in the book - an element that I enjoy myself in recreational mathematics and seek to bring to my math classroom. I wholly expected the Holmes metaphor to create some captivating mathematical mysteries with more than a few twists. Instead I found leaden storylines and transparent mathematics. I can't guarantee this complaint because, uncharacteristically, I haven't finished the book (and probably won't); I have so far only read two of the "stories." I found the first one, which ought to be the "hook", to be absolutely flat... nada. Holmes explained a not-especially-intriguing concept of logic or probability to Watson and then stated it again and again and again as they move through some inconsequential action in an uninteresting narrative. Right to the end I kept waiting for the clever twist - in vain. I sighed and set the book aside, then, and did not plan to read any more. Of course there's nothing like having already paid for a book to bring one back to it. The second piece, exploring some rather counter-intuitive elements of probability that many gamblers fall prey to was a tad more engaging - but not close to gripping. Bruce seems to have the Holmes'ian character and language down pretty well. So what? That establishes a baseline tonality for the book that Holmes fans might enjoy, but it does not supply the oomph that the real Holmes mysteries provide; and Conan Doyle managed that even though we all knew that Holmes would, in the end, get the bad guy and do it in a characteristic way. There are no mathematical or more traditional mysteries solved here. I guess the "bad guy" in these stories is supposed to be generic ignorance and some sort of innumerate tendency in the reading population (expressed via the straw-man "Watson"). Math literate readers will, perhaps, enjoy the poke at the widespread probabilistic ignorance of Watson's "everyman", but where's the fun (or the discovery) in that? In the two pieces I read, Bruce repeated the pattern of giving away the point in the first bit and then just pounding it in to poor Watson's head and the helpless reader. This seemed a clumsy attempt to copy the original in which Holmes would drop some sly suggestion of his focal point and elegantly uncover it for Watson and the reader. In Math Magic, his New York Times bestseller, Scoff Flansburg demonstrated his universal ability to make math fun and easy for adults. 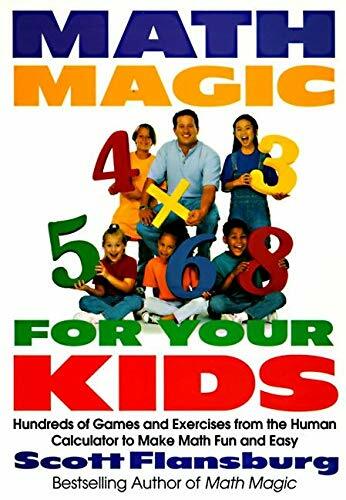 Now in Math Magic for Your Kids, the Human Calculator does the same for elementary school children. Mr.Flansburg's methods of stressing basic math skills are new and important before algebra or higher math will make sense. His new web site thehumancalculator.com also offers more information about his goal to wipe out innumeracy. He taught me it's never to late to conquer math phobia and fulfill my career goals that never materialized because of math avoidance. The book was ok however, I wanted a book for older students. This is recommended for 6 th 8 year olds. The book is in an easy to read format and has breaks to complete exercises to practice what you learned. In a math-phobic era more people should read this book!! I homeschool my kids who like the ideas behind math but find drilling real agony!!! They are beginning to see the fun in it and don't mind repetition any more. Thanks and praise to Scott Flansberg!!! Though math was never a problem for me, I discovered that this book not only made math easier and faster, but it also caused the numbers to take on some practical meaning. I recommend the book for anyone who wants to understand the reason numbers work. I give this book five stars. Though the problems and puzzles were created several years ago, it introduces or, at least, reintroduces the reader to humorous and thought-provoking examples highlighting how intuitive and counterintuitive processes can collide into one another. 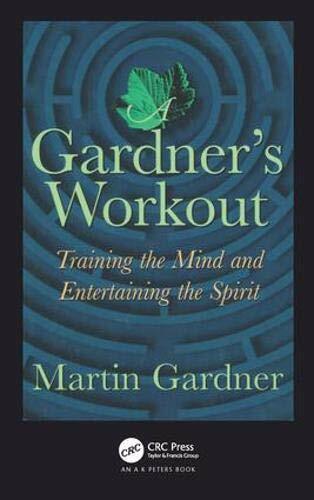 Martin Gardner's witty writing style makes this book a pleasant pathway to the realms of logic. Neat and concise with its stories and challenges throughout and with solutions at the very end, the book is a very ideal read, especially if you are a passenger with a very long trip ahead and who needs good quality entertainment that is also educational. Mathematical problems for all ages with different topics. Entertaining Mathematical Problems by Martin Gardner is a great book for all ages. 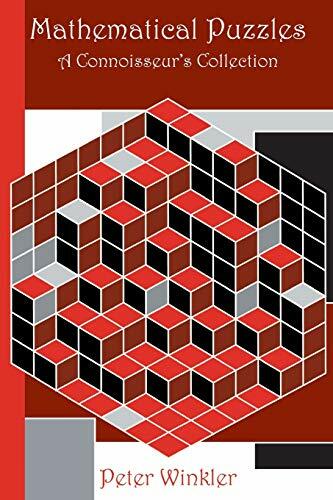 This book has over 100 problems in sections ranging from topology to games. Some of the problems are simple to many, but there are some that require thought to do. Answers are included on the back. Any math lover will surely enjoy this book. "A fascinating compendium of information about writing systemsboth for words and numbers." "A truly enlightening and fascinating study for the mathematically oriented reader." "Well researched. . . . This book is a rich resource for those involved in researching the history of computers." In this brilliant follow-up to his landmark international bestseller, The Universal History of Numbers, Georges Ifrah traces the development of computing from the invention of the abacus to the creation of the binary system three centuries ago to the incredible conceptual, scientific, and technical achievements that made the first modern computers possible. Ifrah takes us along as he visits mathematicians, visionaries, philosophers, and scholars from every corner of the world and every period of history. We learn about the births of the pocket calculator, the adding machine, the cash register, and even automata. We find out how the origins of the computer can be found in the European Renaissance, along with how World War II influenced the development of analytical calculation. And we explore such hot topics as numerical codes and the recent discovery of new kinds of number systems, such as "surreal" numbers. Until recently, the history of computing has tended to be tied to the goals of mathematicians, as they struggled to keep up with the increasing demands of a society growing more technical. As nations began to trade with other nations, the necessity of performing computations on larger numbers very quickly forced changes in the notation. When first introduced into Europe, the modern decimal system of notation was greeted with skepticism and some hostility. However, as is nearly always the case in human endeavors, it was accepted rather quickly, as it was so much more efficient than other systems such as Roman numerals. 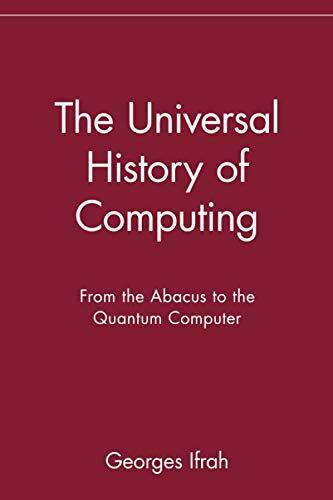 Therefore, the history of computing devices is bound very tightly with improvements in representation, and the historical changes in notation are the topic of the first section of the book. Ifrah does an excellent job in recapitulating the history of the notation of computation, covering the entire world, ending up with the modern notation and the efficiency of binary numbers. Nearly forty pages are devoted to explanations of many ancient numerical notations, and many figures are included. It is this approach that differentiates this book from other histories of computing. Other authors concentrate on the history of the evolving architectures of the computing devices, ignoring the necessary precondition of a compact and efficient notation. It is very difficult to imagine computing devices that could easily perform arithmetic on Roman numerals. The second section is a two track treatment of the development of computing devices. One track covers the mathematical preliminaries and the second the mechanical advances that led to the construction of accurate computers. Most of the early improvements were done by mathematicians, and it was not until the late nineteenth century that governments started to be interested in computers. The primary event was the work of Charles Babbage, who showed that computers were possible and how valuable they could be in performing routine computations that were highly prone to error. In many ways, this history of computing is more a history of the requisite mathematics rather than a history of hardware. This is a second way in which this book differs from other histories. One of the reasons why computers have improved so quickly is that much of the theoretical background for their actions were developed before the machines were. Ifrah explains that in great detail, describing how some of the principles of abstract mathematics have been applied to the building of computers. The final section is very small and deals with the future of computing. This is a wise move, as this book is a history and one thing we have learned from the recent history of computers is that predicting the future is largely impossible. We know that they will get faster, have more memory and the usage will increase, but the consequences of this are difficult to predict. If your interest is in the preconditions necessary for computers to be widely used, then this is the book for you. Ifrah covers all of the notational and mathematical background necessary for computers to be useful, for without that, they would probably have been little more than intellectual toys. Published in the recreational mathematics e-mail newsletter, preprinted with permission. I would have expected from the title that this book might have started in the 1940s (or at the earliest with Babbage and the Difference Engine) and told the story of the development of computers from there. No, as the subtitle indicates, this book goes way back. In fact, the first section is a summary of number systems going back to the age of the Egyptians and before. It's a very methodical and somewhat dry tale, not helped by being translated from the French by translators who feel compelled to insert their own comments at intervals. When it does get going, it provides a history of the relevant mathematics as well as automata from the Islamic era forward. The actual computer era is touched on mostly in its early stages, with the first computers of the forties and fifties. And it concludes with about sixty pages that have nothing to do with history but rather attempt to define key words such as "information" and "computer." All in all, it is a methodical and thorough book, perhaps a little dry but not as much as some books I have read. The author muses on the implications of various stages of discovery rather than simply relating the facts (and the translators chime in as well), which enlivens the story. Still, this book is probably for the more interested rather than the casual reader. Famed puzzle expert explains math behind a multitude of mystifying tricks: card tricks, stage "mind reading," coin and match tricks, counting out games, geometric dissections, etc. Probability, sets, theory of numbers clearly explained. Also, more than 400 tricks, guaranteed to work, that you can do. 135 illustrations. One of the most fantastic books on close-up magic.